Libre Black Brush Tea Glass offers a serene and delicate pattern of light brush strokes and small clusters of pale blossoms, inviting you into a tea moment every time you gaze at it. And now truly, a tea moment with basic black – anytime, anywhere. And with the new masculine black, the men are gonna want it as their best ‘to go’ tea drinkin tool. 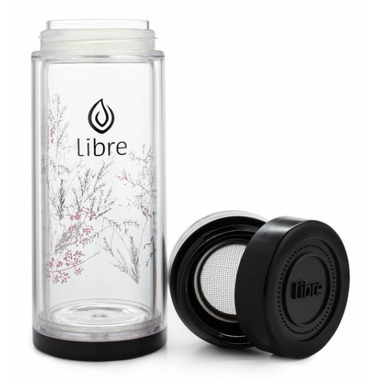 The Libre Black Brush Tea Glass is portable – the easy clean glass is great for all teas hot or cold, and fruit’n herb waters – just wash up and you’re ready to go with no left overs of your last beverage taste. Do you love to invent your own beverages with fresh fruits and herbs, or cucumber and citrus? The removable filter will keep these ingredients in the glass flavouring your water for original refreshment. Perfect for car cup holders, pop on the lid for carrying in your travel pack, purse or yoga bag. I wish I could post a picture! I own 3 of these and have had them for the last few years. I don't use them much at all, but when I want to take tea out with me somewhere the rare time, they come in handy. BUT, buyers should be aware that not only does ALL 3 of them leak (from day 1), 2 of mine have a good amount of water (about 1/2 inch) trapped between the plastic outer shell and the inner glass one! This looks disgusting as the water is grey with little particles of things floating in it- obviously food particles from washing them in the sink-I don't have a dishwasher. So for how little I have used them, this is a sad state of affairs. I also don't find them easy to drink from either with the tops being made as they are. I would not buy them again, and will reuse mine as flower vases outside on the picnic tables. That is about all they are good for. I have two of these. Bought one when they first came out-leaked, and bought one last year, slim design. I was hoping newer model, slightly different design, that it wouldn't leak-but it still does.